Clara Hammer, above, was a "mitzvah lady," says her daughter, who will carry on the work. (CNN) -- Her adopted brood included a Russian immigrant who had lost an eye to cancer and a family whose father was killed by a suicide bomber on a bus. Clara Chaya Hammer, a Jerusalem great, great-grandmother who endeared herself to thousands by making sure the city's needy received a proper meal on the Jewish Sabbath, died in March just shy of her 100th birthday. Known around the world as "The Chicken Lady of Jerusalem," Hammer spearheaded a fund that provided free chicken to her charges every week -- or a substitute, if they happened to be vegetarian. She once quipped, "Just because they're vegetarian, I don't have to punish them." One of Hammer's daughters and great-granddaughters will carry on "The Chicken Lady's" legacy. "We decided in the family we have to continue what she started 30 years ago," said daughter Chana Homnick in Jerusalem. "We're continuing the Clara Hammer Chicken Fund to feed over 250 families." The monthly butcher bill tallies about $10,000. Hammer, a widow and retired Hebrew teacher, made it her job to give the neighborhood butcher plenty of business. It all began when she stood in line at the butcher shop to buy chicken for the Sabbath herself. She noticed a young girl in front of her receiving a plastic bag full of chicken fat and skin. Curious, she asked the butcher: "How many cats or dogs does that family have?" He explained the family had many children and the father was on dialysis. They had run up a tremendous bill, so the butcher just gave them fat and skins for a soup for Friday dinner and a cholent, or stew, for Saturday lunch. Hammer declared: "You give them every week two chickens and a half kilo of turkey, and I will pay for it." Soon the butcher, rabbis, social workers and friends began telling her of other families who needed help, and the fund grew. At first, Hammer's family helped her foot the bill. Then the cause took wing, with donors from around the world sending money. All received a handwritten thank-you card from Hammer and a copy of an article about the effort. For nearly 30 years, Hammer single-handedly ran the operation from her dining-room table. She would have been 100 on May 19. Born in Russia in 1910, she survived a pogrom in the Ukraine and fled with her family to Romania. Enduring hunger, illness and imprisonment, they made their way to Palestine and lived in a tent for three years. With no hospital care available, they were advised to leave for the United States. Her mother, who had contracted tuberculosis, died two years later, when Hammer was 14. Decades later in Israel, Hammer reflected: "I have a tremendous amount of sympathy, what we would call 'rahmanut,' for people who are hungry, thirsty, in pain, have any type of needs." Among her many awards were an honorary "doctorate in kindness" from Yeshiva University at age 98 and the Jerusalem Prize for Good Citizenship at age 90. "My mother did so many wonderful things for so many people. 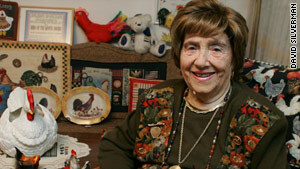 Instead of being called 'The Chicken Lady,' she should be called 'The Mitzvah Lady.' The main thing is she wanted everyone to feel good. She was very special," said Homnick, one of Hammer's three daughters. Other survivors include nine grandchildren, 35 great-grandchildren and 24 great, great-grandchildren. Ralph Resnick, a nephew in Los Angeles, California, remembers Hammer as a larger-than-life personality. "I think the ripples of her mitzvah, of her good deed, have emanated far and wide. It's a wonderful lesson of how something like that can start and influence so many people -- and not just the people she helped. It's almost like 'Pay It Forward.' It really happens in real life too. "I wish she had lived to 100."